Outfits give Dollikin a much-needed range of looks. 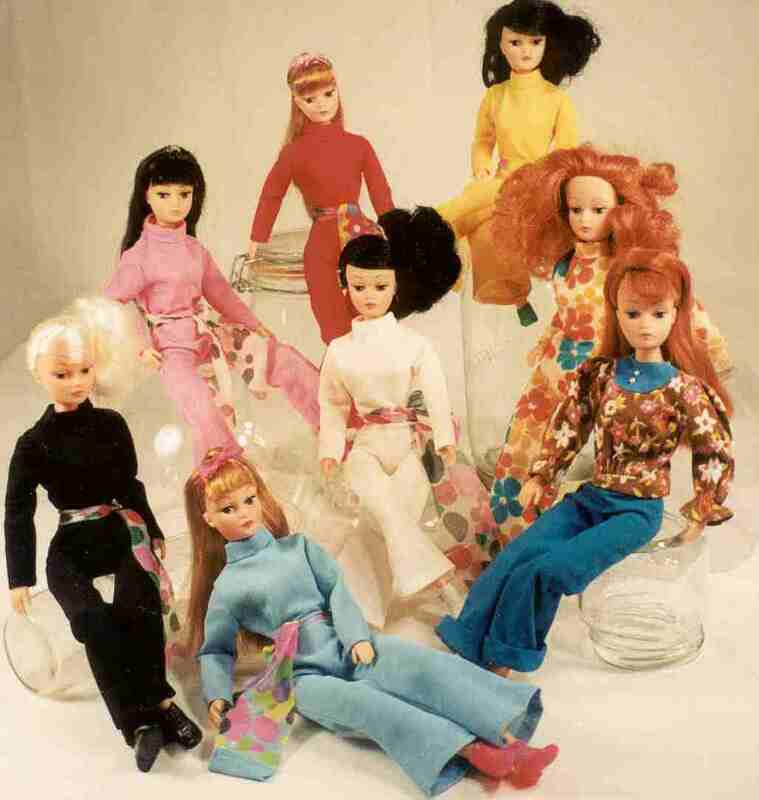 An array of dolls clad only in the original yellow, rose and blue jumpsuits can look disappointingly uniform. This is partly due to the fact that Dollikin's facial features never varied. But this effect is heightened by the closeness in colour of the strawberry blonde and pale-red hair on the basic Dollikins. Palitoy gave its fairhaired Action Girls stronger visual identities by creating very pale and gold-streaked versions of blonde. I like the brunette basic Dollikin and the black-haired Action Dollikin because they stand out in the blonde-filled fashion-doll world. There are outfits for Dollikin and for WT Grant's Action Donna in the US, as well as for Action Girl in the UK. 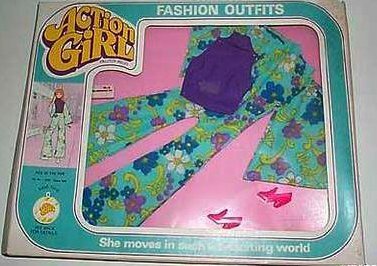 While Dollikin's outfits are stylishly mod, Action Donna's outfits emphasize the unisex looks of early-70s fashion, and Action Girl's wardrobe mixes mod looks manufactured for her US cousin with intensely patterned psychedelia-inspired styles. Below left, Wet and Wild, which features a white-vinyl fireman-style jacket; below middle, Pick of the Pops; below right, unnamed jeanswear. 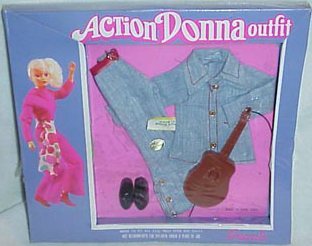 See more Action Donna outfits. 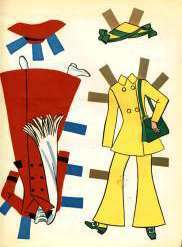 View several boxed examples of Dollikin outfits, issued by Mego, at Jan's fashion dolls. Heretofore unknown Dollikin outfits called Cycle Suit and Snakes Alive recently turned up in boxes different from the familiar type displayed above. This likely means that there is a second range of Dollikin outfits waiting to be discovered. If you have a good scan of the outfits depicted on the back of this box, please send it to D is for Dollikin. 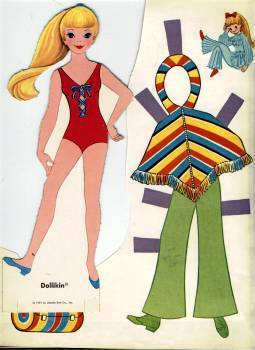 For illustrations of many of the outfits made for Dollikin, buy the 1971 Whitman set of Dollikin paper dolls, which features a comically cute rendering of a blonde basic Dollikin. The pink-ribboned white dress with flower-strewn red hat is a bizarre anomaly in Dollikin's wardrobe. Called Party Time, it may be a masquerade costume. 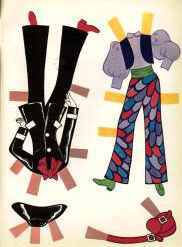 As far as I know, Whitman's boxed Magic Dollikin does not illustrate actual Dollikin outfits. 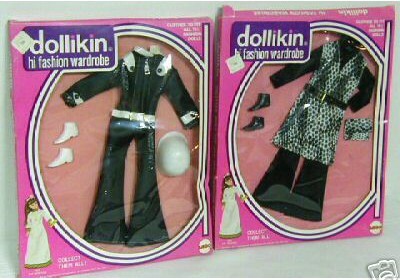 Because so little is known about Dollikin, many eBay sellers innocently make inaccurate claims about the originality of the vintage outfits that the dolls happen to be wearing when dug out of someone's attic. Be especially wary of claims that an item is "hard to find," as Dollikin expertise is not sufficiently developed to make such designations meaningful. Searching out authentic outfits, none of which seems to have been tagged, is a wonderful challenge for the Dollikin collector. Conservatively feminine looks are not likely to be authentic, although the line does offer the de rigueur wedding dress. (Since Uneeda didn't produce male companions for Dollikin or LMD, one assumes that they looked for love on other toy shelves.) 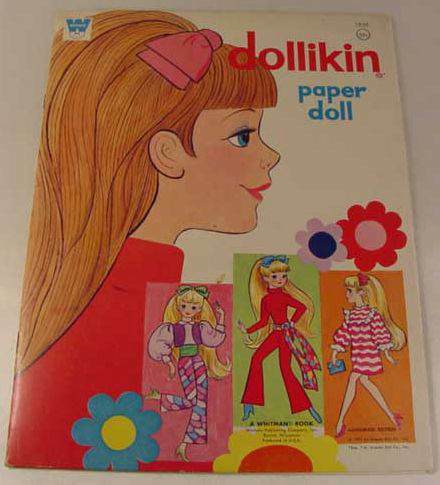 When Dollikin does wear a dress, she sports a sassy striped mini chemise. Smart vinyl outerwear, hiply tailored suits, and see-through ensembles embody Dollikin's style. The Dollikin outfit on the left is likely authentic because it closely resembles an outfit made for Uneeda's Little Miss Dollikin variant, Triki Miki. The jumpsuit on the right suits Dollikin so perfectly that it might as well be another type of original outfit, especially as accessorized with those fab yellow boots. Dollikin looks great in generic outfits true to the period and to her bold and colour-conscious style. 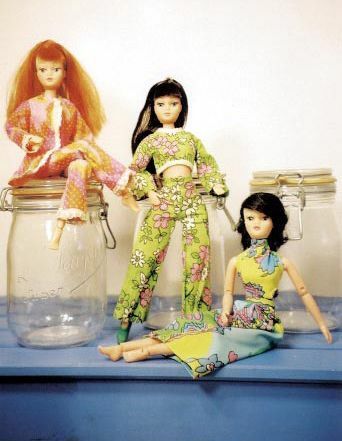 My two brunette Dollikins look sensational in their cleverly cut and carefully patterned unidentified outfits. Who knew 1970 could look this elegant? Because Dollikin cannot wear shoes designed for typical 11.5" fashion dolls, the middle doll's pliable rubber Francie booties are an exceptionally successful steal. 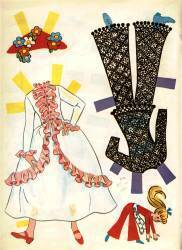 My redhead Dollikin borrows a set of wildly coloured lace-trimmed PJs from Mego's Maddie Mod. Maddie's PJs weren't the only outfit cut from this crazy cloth. Uneeda fashioned it into a slinky cheongasm-inspired dress for a redux Dollikin. 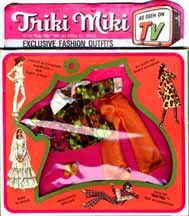 The fabric appeared again in Triki Miki's Country Fair dress and Vacation Wear suit, which were issued by M&S Shillman, as well as in other outfits for cheaper 6.5" dolls like Mego's Dizzy Girl, Tiny Teen and Lisa. The relationships among the various doll and clothing companies and manufacturers are too complicated to plot, but the same fabrics, and oftentimes outfits, turned up in different lines. I like to imagine that all the companies manufactured out of the same Hong Kong neighbourhood, passing around no more than a half dozen rolls of fabric, and thus managing to clothe every doll in the First World without waste. Naturally, Dollikin has a place to stash her hip wardrobe. 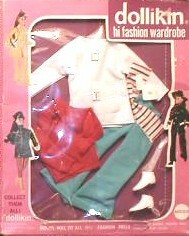 A carrying case features two posing Dollikins clad in the regular jumpsuits but belted with variant sashes that seem never to have been produced for market. Unfortunately, the picture of the dolls was pasted to the front, so each case now shows an unsightly glue stain.